The First Nations languages of the world, many of which are renowned for the complexity and richness of their linguistic structure, embody the cumulative cultural knowledge of Aboriginal peoples. This vital linguistic heritage is currently under severe threat of extinction. This new series is dedicated to the linguistic study of these languages. There are now eight publications in this series. 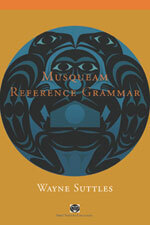 The Musqueam Reference Grammar by Wayne Suttles was released in 2004. Suttles began this work with Musqueam in late 1950s. Click here to learn more and view the full series.